Yup, this 60 year old Grandmother of 4 is the only female that works in a warehouse with 22 men, which is not easy. All they seem to talk about is Golf ??? Well maybe you know how it is. Most of the guys are pretty good with me. So I try not to complain too much. But then again I'm not the easist person to get along with. Most of the time I drive a PLATFORM-LIFT. 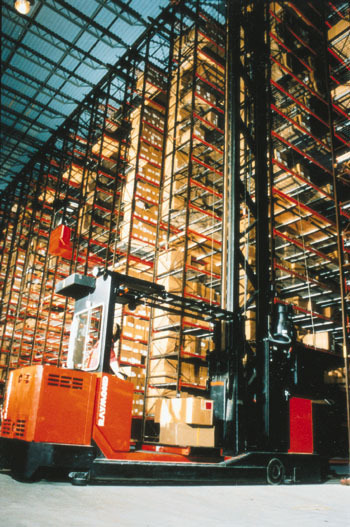 It goes the height of a standard size warehouse. The whole thing rises with you in it, only the motor and battery stay on the floor. I also operate a Raymond 'Hi-Rise' when I'm at our other job-site. Now this baby will go as high as it is designed for: ours went 4 or 5 stories up, and to qualifiy for a license you had to repel ( jump ) off the back. I sure did not like that !